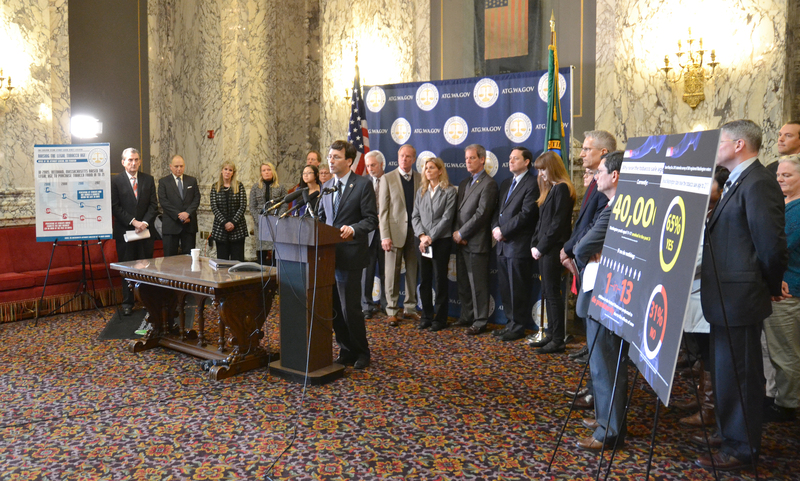 Attorney General Bob Ferguson speaks at a press conference announcing an Elway Poll showing overwhelming support among Washingtonians for raising the purchase age for tobacco. 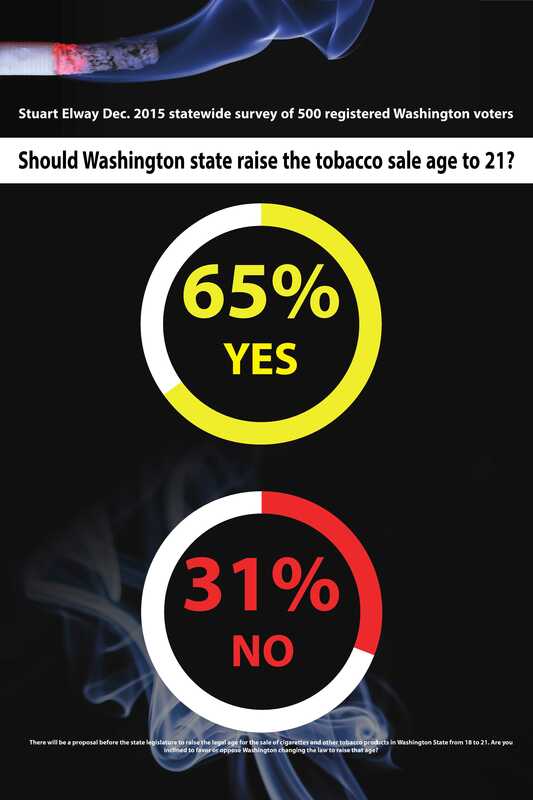 The poll, commissioned by the Campaign for Tobacco-Free Kids and issued by Elway Research, an independent research firm, surveyed 500 registered voters in Washington state from Dec. 28-30, 2015. The results show strong support among both men and women and in every region of the state. Support in Eastern Washington (66 percent) was similar to support in Western Washington (70 percent). Additionally, the poll found strong support across political ideology, with 66 percent of Republicans and 72 percent of Democrats supporting increasing the tobacco sale age. Washington has long been at the forefront of the fight to protect youth from the dangers of smoking . Continuing that leadership role, Ferguson’s proposal would make Washington the second state, after Hawaii, to raise the legal tobacco sale age to 21. The Attorney General request legislation has strong bipartisan support through Senate Bill 6157, sponsored by Sen. Mark Miloscia (R-Federal Way), and its companion bill, House Bill 2313, sponsored by Rep. Tina Orwall (D-Des Moines). "Nine out of ten adult smokers start using before the age of 21,” said Orwall. “By raising the purchase age of tobacco, a highly addictive drug, we can help prevent youth from smoking, which often leads to a lifetime of addiction and health issues." A Washington Healthy Youth Survey released in 2015 showed about 40,000 Washington youth aged 11-17 smoked in the past 30 days. Ending legal tobacco purchases by older high-schoolers will make it more difficult for all teens to get started on a path to lifelong addition. According to the Centers for Disease Control, one in 13 Americans age 17 or younger alive today are projected to die prematurely due to the effects of smoking. Research indicates the best way to prevent these deaths is to stop teenagers from starting to use tobacco products in the first place. In 2015, a report issued by the Institute of Medicine found if the tobacco sale age were raised to 21 nationwide, children born between 2000 and 2019 would suffer 249,000 fewer premature deaths, and 45,000 fewer deaths from lung cancer. The report also said the largest proportionate reduction in smoking would be among 15 to 17 year olds. Overall, 117 jurisdictions have raised the tobacco sale age to 21, including New York City, Cincinnati, Independence, Mo., and Kansas City, Kan. Smoking kills 8,300 Washingtonians every year, and $2.8 billion in health care costs are directly attributed to tobacco use in the state. An average of $821 is paid each year by every Washington household for smoking-related healthcare — even if nobody in that household smokes. In 1998, Attorney General Chris Gregoire took on Big Tobacco when companies were using cartoon animals and other efforts to market cigarettes toward children. A multi-state, multi-billion dollar agreement banned tobacco companies from marketing to kids and brought billions to Washington, funding anti-tobacco efforts and health insurance for low-income Washingtonians. HB 2313 has a hearing today at 1:30 p.m. in the House Committee on Health Care & Wellness in House Hearing Room A in the John L. O’Brien Building. The hearing will be broadcast on TVW. The complete list of sponsors for HB 2313 are: Representatives Tina Orwall (D-33), Chad Magendanz (R-5), Sam Hunt (D-22), Paul Harris (R-18), Eileen Cody (D-34), Norm Johnson (R-14), Derek Stanford (D-1), Terry Nealey (R-9), Larry Haler (R-8), Roger Goodman (D-45), Marcus Riccelli (D-3), Richard DeBolt (R-20), Gerry Pollet (D-46), Shelly Short (R-7), Ruth Kagi (D-32), Laurie Jinkins (D-27), Drew Stokesbary (R-31), Chris Kilduff (D-28), Chris Reykdal (D-22), Kevin Van De Wege (D-24), Joan McBride (D-48), Jake Fey (D-27), Steve Bergquist (D-11), Steve Tharinger (D-24) and Noel Frame (D-34). The complete list of sponsors for SB 6157 are: Senators Mark Miloscia (R-30), Marko Liias (D-21), Karen Keiser (D-33), Steve Litzow (R-41), John McCoy (R-38), Maralyn Chase (D-32), Steve Conway (D-29), Jaime Pedersen (D-43), Rosemary McAuliffe (D-1) and David Frockt (D-46).